Surgery for overly prominent ears is a common request at all stages of life from mid childhood. Some females are able to disguise their ears until they attend schools which stipulate that their hair must be worn tied back. Many adults also request this surgery. What is the cost of prominent ear surgery? The cost depends on whether surgery is done under local or general anaesthetic. Most people from late teenage years onwards have the procedure done while they are awake under local anaesthetic. For the current fixed costs please either email us or phone us on 0800 268 526. The quoted cost for surgery covers everything including theatre fees, consumables and all the follow up for dressings and checks in the first year after surgery. This cost includes GST. Can I see examples of Charles Davis prominent ear surgery? 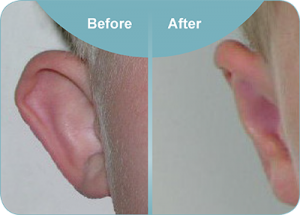 Examples of ear setback surgery performed by Mr Davis are shown during a consultation to illustrate the typical range of results, the limitations of surgery and the placement of the scar. Does Dr Davis treat other types of ear conditions? Charles Davis treats a wide range of ear conditions including total ear reconstruction for children born with a small or absent ear (microtia) or following accidents and cancer treatment. He also does operations for split earlobes, stretched earlobes, various ear tumours and a variety of unusual ear shapes. He is a member of the International Society of Auricular Reconstruction. How is prominent ear surgery done? There are many techniques for Otoplasty (prominent ear correction). The technique used will be determined by the type of prominence seen. The various types of surgery are all performed using an incision at the back of the ear. It can be performed any time after the age of five and I prefer to wait until it becomes an issue for the child. There is no upper age limit. The more mature the ear cartilage, the more reliable the result. Do I need to wear a head bandage after surgery? This depends on the technique used and in some cases it is possible to “super glue” the ear into position after surgery without the need for bandages. However it is my experience that wearing a bandage after surgery is generally more comfortable for most patients. Can things go wrong with prominent ear surgery? Dr Davis gives his patients a copy of the Australian Society of Plastic Surgeons information sheet which summarises to main risks of surgery. This is available on request for people considering the surgery. Please email or phone the office. The most likely “risk” is that the ears are either pinned back too far or not enough and this position can change for many weeks after surgery. Ears are never perfectly symmetric but should not look grossly asymmetric. About 5% of cases may need a revision procedure if partial protrusion recurs or obvious asymmetry occurs. Other risks include sensitivity for a period, unusual skin folds and poor scars in a small number.